Slim and lightweight elegance design provide with more comfortable holding. The body has the large LED screen to show the information like the length of the blade and the battery capacity. You could know how much time you got left on the battery and the length of blade it is running. 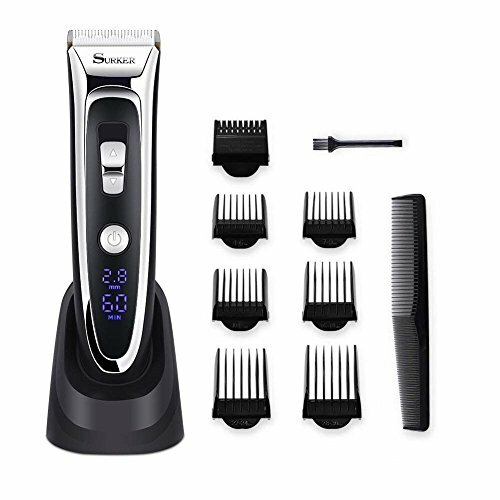 We like the cordless option, this hair trimmer could be used with cord or cordless. It gives you full freedom of movement while you're on the job and allows you to use it anywhere at any time without the hassle of a cord. What's more, it's easy to take with you and use while you're traveling. It is powered by high performance motor to provide twice the power as standard motors. Build in lithium-ion power gives you up to 60 minutes run time. 1.5H to fully recharge. The titanium ceramic blade is suitable for all kinds of hair and it supports precise length setting adjustment range from 0.8mm to 2.8mm. When looking for hair clippers, you will want to consider not only how powerful the clippers are and how well they cut hair, but also how easy they are to use. It provides attachments like 7 comb guides , lubricating oil, a cleaning brush and a charger stand to make it easy to get the specific length of hair you desire. Please don't wash and use it underwater, but you could take off the blade head and wash the head only.